and if there is an outage at the time you are checking availability/pricing or viewing photos please call us. When you are looking for a great place to enjoy a vacation or getaway in the southeast, your mind may initially go to the beaches of Florida. If you're not much of a beach, person, however, you may be a little stuck on where you should go. What are your alternatives for taking a trip that is more inland but still packed with fun things to do and fabulous amenities? Our luxurious cabin rentals are located in Helen, GA - home to the closest mountain to Florida and there is plenty of excitement to have as you enjoy the great outdoors during the Fall season. Here are four of our top recommendations for making your vacation to the closest mountain to Florida truly special and grab some fresh mountain air. There is hardly a sight in the world that could stack up to the gorgeous colors you will find during the autumn on the closet mountain to Florida. Because of the brilliant fall foliage, we are sure you will want to get out of your cabin and experience the great outdoors. 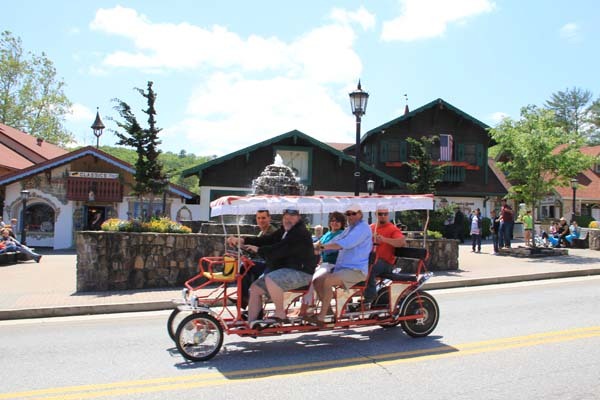 When it comes to northern Georgia there is truly something for everyone, so grab your group and get ready to have some fun outside! 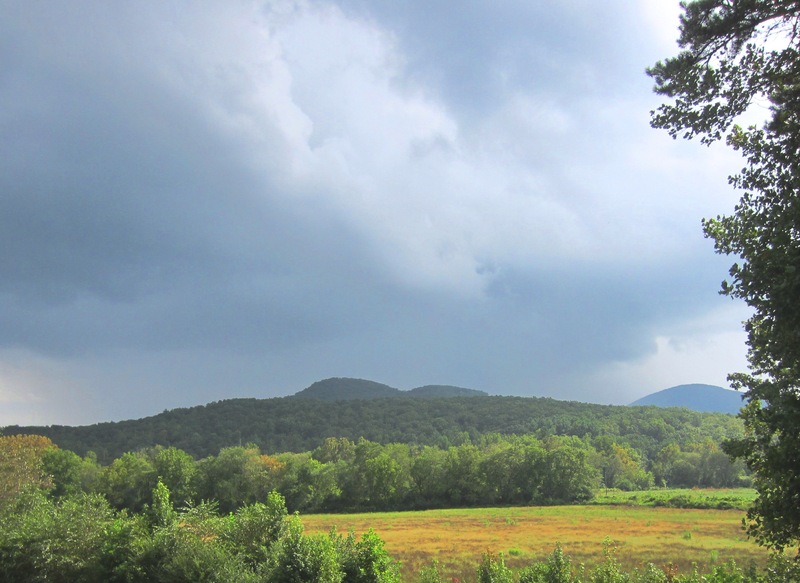 There are numerous hiking trails dotting the landscape of the closest mountain to Florida. One of the most popular destinations for hiking near our Helen cabin rentals can be found at Unicoi State Park, which is also home to Anna Ruby Falls. The trails in this park range from easy to challenging, but all of them will offer spectacular views of the leaves' changing colors and of the waterfalls themselves. Another great trail to try which offers gorgeous fall scenery can be found in The Chattahoochee National Forest Scenic Area. 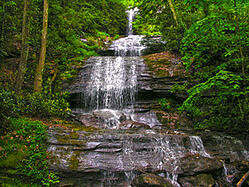 The DeSoto Falls Trail is 2.4 miles log and is of moderate difficulty. The trail which was named for explorer Hernando DeSoto, is absolutely breathtaking during the peak leaf season in autumn. As you traipse through the vast timberland forests amongst brilliant hues of red and orange leaves, you will chance upon two separate waterfalls on Frogtown Creek. A favorite pastime of the locals and visitors of the closest mountain to Florida alike is fishing. The Chattahoochee River is home to an incredible number of trout, making it perfect for the avid fisherman. One fabulous opportunity you will come upon in Helen, GA is the chance to learn how to go fly fishing. Unicoi Outfitters is located in Nacoochee Village and is well known for their fly fishing lessons. All of the guides at Unicoi Outfitters have been specially trained and certified to teach newbies and offer refresher courses for those who have not engaged in the sport for some time or simply want to improve their fly fishing tactics. Beginners will definitely want to sign up for the Gilligan Special. This introductory course will allow you to learn all of the basics of fly fishing from the professionals. Your guide will start by training you on the basics of casting and fishing instruction in an hour long session, followed by two hours of actual fishing on one of Unicoi Outfitters' trophy trout streams. The store provides all of the rods, reels, flies, and other fishing equipment. You'll have a great time and hopefully have something to bring back and cook up in your own private kitchen, in your North Georgia mountains cabin. Plus you will walk away from the closest mountain to Florida with a newfound skill set. One fun way to explore the village of Alpine Helen is to rent a (non traditional) Surrey bike from Alpine Adventures. You a nd your sweetheart or even your entire family can all jump in and enjoy an extremely unique way of creating memories and enjoying the sights and sounds of the closest mountain to florida while breathing in that crisp, fall air. Alpine Adventures Surrey Bike Rentals offers a fun way to discover hidden shops and gems within the Helen area while also enjoying the autumn foliage and bonding with your family or friends. No matter what your age or experience level, everyone can enjoy a horseback ride through the Chattahoochee National Forest. Depending on how long you would like to be on the trail, you will have numerous packages and options from which to choose. If you would like, you can request a sunset hike for romance or you can even incorporate a stop for fishing and a picnic into your ride. Regardless of what you choose, however, you are sure to have a wonderful and unforgettable experience on the closest mountain to Florida. How will you spend your time in the great outdoors? Cedar Creek Rentals, LLC. Copyright 2006-2017 - All rights reserved. Helen GA Cabin Rentals - Photography provided by Brian Clarke. Site Maintained by Jason Montoya.